MOSCOW — President Donald Trump may have held more meetings with Vladimir Putin at the G-20 summit earlier this month, Russia's Foreign Minister Sergey Lavrov said Friday — but he shrugged off the importance of the encounters. “They might have met even much more than just three times,” he told NBC News’ Keir Simmons in an exclusive interview, dismissing speculation about the leaders' meetings. "Maybe they went to the toilet together," he joked. Asked whether the two presidents had other conversations or met in the corridors of the G-20 meeting, Lavrov used the analogy of children mingling at a kindergarten. “When you are bought by your parents to a kindergarten do you mix with the people who are waiting in the same room to start going to a classroom?” he asked. Lavrov echoed the White House account of a third meeting between Trump and Putin during a social-dinner at the summit in Hamburg. The other two meetings — one a scheduled bilateral meeting and another when the pair shared a handshake — had already been widely reported. “After the dinner was over…I was not there…President Trump apparently went to pick up his wife and spent some minutes with President Putin…so what?” he said. 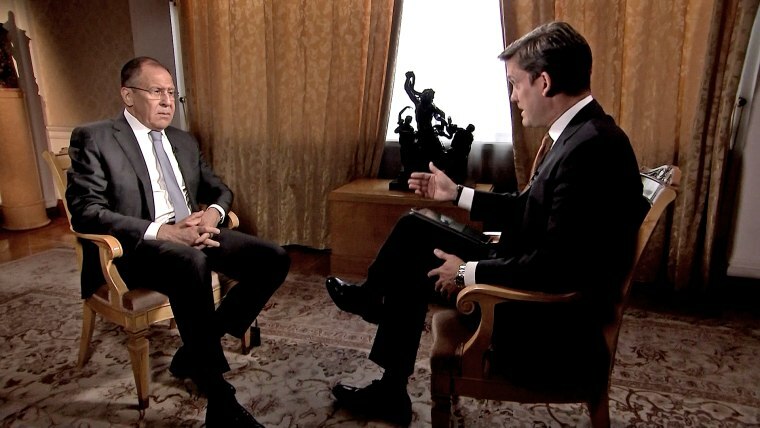 Lavrov also said the U.S. presence in Syria was illegitimate and accused C.I.A director Mike Pompeo of having “double standards” regarding the establishment of military bases in the country. Turning to North Korea, the Russian foreign minister confirmed that Russia would not support regime change. “We do not believe in regime change anywhere,” he said. Lavrov said Russian intelligence showed that North Korea’s test missile launch earlier this month was not an intercontinental weapon, as reported by U.S. officials. “Our objective data we received from our radars located just on the border with North Korea and according to that data it is not an intercontinental missile,” he said. Asked why Russia does not consider North Korea a threat, Lavrov responded: "I cannot say we are not considering a threat what is going on on the Korean peninsula, because of what North Korea is doing in gross violation of the Security Council resolutions." He added that he did not understand the purpose of portraying Russia as "appeasing" North Koreans and "acquiescing with what they have been doing." However he said Russia would not support United Nations Security Council resolutions which are "designed to completely suffocate the North Korean economy," saying the U.N. could not stop nuclear programs "at the expense of hundreds of thousands of lives of North Koreans."